We get it: Cooking in the kitchen with your kids can be equal parts rewarding and nerve-racking. While there’s no doubt that there are treasured moments waiting to be had, it’s the test of patience and potential hazards that more times than not keep parents from welcoming the extra sets of tiny hands. But here’s the thing: It doesn’t have to be that way. With the right preparation and safety-first mentality, the whole family can have fun being creative in the kitchen together. Here’s how you can kick-start your kiddo’s cooking experience. Kitchen counters aren’t exactly kid-friendly. To be safe in the kitchen, your kids are going to have to see what they’re doing, and sitting on the counter, floor or wobbly stack of pots and pans isn’t going to cut it. Make sure your kids have a secure stool or chair to sit on that won’t move as they cut, rinse or mix. KEEP CLEAR OF SHARP CORNERS. Sharp corners seem to be everywhere when children are around, and that doesn’t stop in the kitchen. From the corners of an open oven to those pesky eye-level countertops, learning how to move in a kitchen is just as fundamental as the ingredients. In fact, did you know that in commercial kitchens, everything is set up to be within a step or two at all times for efficiency and safety? Teach your children to understand and respect the space in a kitchen and to always be aware of where they stand in relation to other objects. BE MINDFUL OF THE STOVE. No-brainer, right? If it’s on, stay away – but guess what: Due to residual heat, the average oven can still be hot to the touch 30 to 40 minutes after it’s been turned off. Don’t just teach kids to look for the on/off indicators but instead to work in the kitchen as if the oven or stove is always on. That means never touching the burners, never leaving items on top of the stove – like a newspaper – and always using potholders to open, close or when removing something from inside or on top of the oven. Something to remember: Hot doesn’t only pertain to the oven itself. Watch out for hot pans, and never add water or freshly washed ingredients – that are still wet – to hot oil; doing so will result in a splattering of dangerous oil. Ouch. KNOW YOUR KNIVES AND UTENSILS. Kids shouldn’t be taught to fear knives in the kitchen but instead just, well, taught. Educate your entire family about the safety of knives: which knives to use (i.e., bread, butter, carving, chef’s) and how to handle them properly. Of course, the general rule should be to never use a knife without parental permission or observation, but, even when Mom or Dad is present, we want kids to know how to use the tools they have to work with. As for utensils, again education is key. And a little bit of common sense: Always hold them by the handle, don’t plug/unplug while on and always – always – keep your hands out of the blender! We all love to lick the batter from the bottom of the bowl, but, if we’re being honest, that’s technically a no-no. Should you slash this quintessential childhood rite of passage? Of course not! Concoct your very own delicious, “eggless” cookie-dough batter with a simple search online, just to stay on the safe side. See the recipe to the right, letting your children add colorful sprinkles and various chip flavors. If you want to avoid food poisoning or possible salmonella, teach your kids the importance of handling raw food with care and exclusivity. Each different meat should get its own cutting board – you can even grab a variety pack of colored cutting boards to keep it simple – clean all utensils and hands with soap after handling raw meat and know what temperatures each meat is required to be cooked to. Don’t let the “what ifs” keep you from making memories that will last a lifetime. 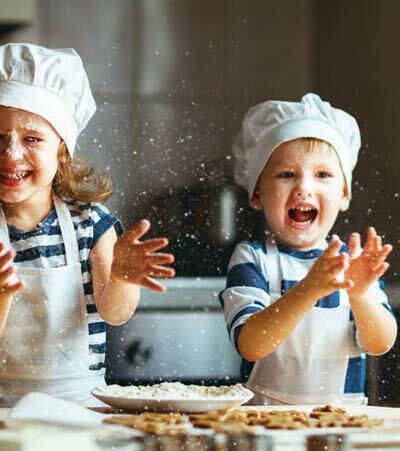 From Christmas cookies and taco night to Mom’s homemade double-choco brownies and Dad’s famous spaghetti and meatballs, these are the moments – and life skills – you want to pass on to your children. All you need is a little safety 101 to get started! 1 cup mini chocolate chips, sprinkles, marshmallows – get creative!